Devel­op the skillsets need­ed to guide the deliv­ery of val­ue in a Lean enterprise—and learn about the activ­i­ties, tools, and mechan­ics used to man­age back­logs and programs—by becom­ing a SAFe® 4 Prod­uct Owner/Product Man­ag­er (POPM). Dur­ing this two-day course, atten­dees will gain an in-depth under­stand­ing of the Agile Release Train (ART), how it deliv­ers val­ue, and what they can do to effec­tive­ly per­form their role. They will also learn how to apply Lean think­ing to write Epics, break them down into Fea­tures and Sto­ries, plan and exe­cute Iter­a­tions, and plan Pro­gram Incre­ments. Final­ly, atten­dees learn about the Con­tin­u­ous Deliv­ery Pipeline and DevOps cul­ture, how to effec­tive­ly inte­grate as Prod­uct Own­ers and Prod­uct Man­agers, and what it takes to relent­less­ly improve the ART. 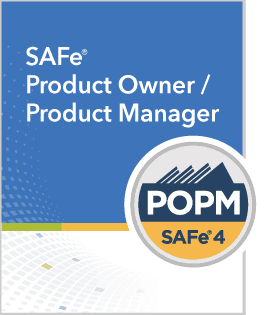 Dieses 2-Tages-SAFe POPM-Train­ing begin­nt mit den Prinzip­i­en von SAFe und dem Lean-Agile-Mind­set. Danach ler­nen Sie die Rolle des Prod­uct Man­agers und des Prod­uct Own­ers in einem SAFe-Umfeld ken­nen. Dabei wird auf Agile Require­ments, Back­log Man­age­ment und Fea­tures einge­gan­gen. Ein weit­eres wichtiges The­ma dieses Work­shops ist auch Stake­hold­er Man­age­ment.